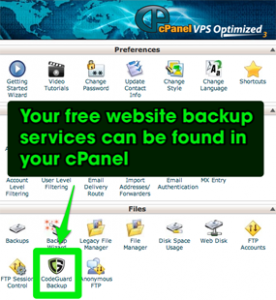 CodeGuard’s website backup service to your account. Trust the leading website backup service in the world! Automated Daily Backups that never let you down. CodeGuard offers the most reliable backup on the market – 99.999999999% reliable. We achieve this by replicating your data in secure locations across the world – again and again and again. Receive ChangeAlerts when content on your site changes. When CodeGuard takes the daily backup, it compares what is on your website with the last version of your website stored CodeGuard’s system. If any changes are found, CodeGuard emails you with the details! Use Time Machine to view older versions of your website! CodeGuard takes a picture of what your website looks like each time it takes a backup. Then, when you need to sort through older versions of your site, it’s much easier when you can look at them! CodeGuard helps should anything go wrong – deleted files are now recoverable, overwritten files are now obtainable, and if your site is hacked, the malware is easily removable. All of this with nothing to install. You can rest safe knowing that CodeGuard is also looking out for malware. We interact with Google on a regular basis to make sure your site is neither blacklisted nor infected. CodeGuard seamlessly backs up your source and databases. And it does it in an elegant way that saves you space and makes it easy to see changes between each backup/version.